We believe in the value of relationships. We view every clients relationship like a partnership, and truly believe that our success is a result of your success. We are committed to providing close, personal attention to our clients. We take pride in giving you the assurance that the personal assistance you receive comes from years of advanced training, technicial experience and financial acumen. Our continual investment of time and resources in professional continuing education, state-of-the-art computer technology and extensive business relationships is indicative of our commitment to excellence. The Better Business Bureau has reviewed our company! Read the review HERE. Aurora Financial Services is dedicated to improving the financial health of the average family and increasing the wealth of our clients by legally minimizing the monies paid out in income taxes. It is our goal to continuously upgrade our skills in order to know the tax saving strategies available and when to implement them. We believe this requires a coordination between AFS and the client to identify when new strategies are needed before it is too late to implement them. Bill is originally from upstate NY (much different from the city). 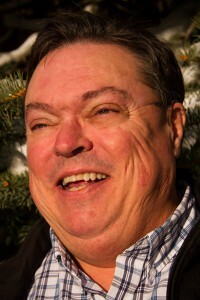 He originally studied accounting and business administration in college but somehow drifted into the sciences and into Colorado and received his bachelor’s degree in Chemistry from UCCS in 1982. After a couple of decades in Chemistry, the glitter began to wear off and Bill felt the pull back into accounting and business. He began preparing individual taxes professionally in 2000 and soon after gained his Series 6 license for securities and his life insurance license. He and his daughter started Aurora Financial Services (AFS) in 2004, preparing taxes and offering life insurance and investments. Bill always liked working with numbers but found that working with people’s finances and taxes was infinitely more interesting that working with chemical models. Experience gained in working on the investment side of finance has helped immensely in the tax preparation side. Luckily Bill has always believed in lifelong learning, because the tax preparation industry demands it. He says that there is nothing more satisfying than putting in place a new tax strategy that can save his clients’ money. He is now studying for the Enrolled Agent certification and is also learning about the Tax Problem Resolution industry. When he is not in the office, Bill might be reading or walking or puttering around the house. He and his wife Sue love to travel and the travel is often combined with tax learning, as the best seminars are often located in the most popular travel destinations. Melissa Flickinger is a Colorado native, born in Colorado Springs but moved to Aurora in 1990 and has been there ever since. Melissa has always been strong in Math and found her place when Aurora Financial Services, LLC (AFS) was born. She went to school and received a degree in Accounting from Argosy University. 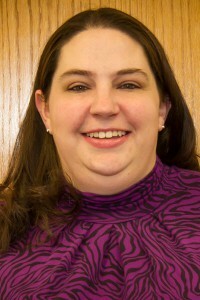 She is our lead bookkeeper and contact for our small businesses on payroll and sales & use tax returns. Melissa recently started a free-standing bookkeeping business. 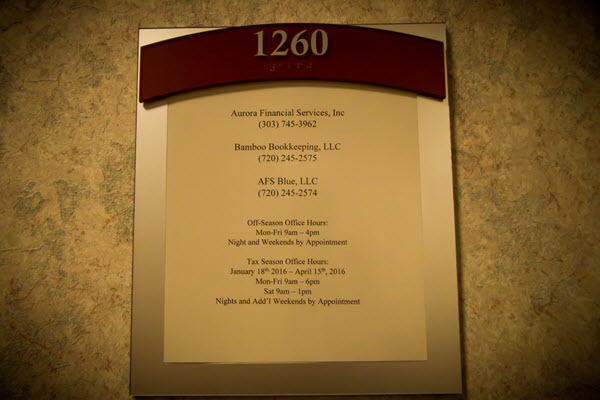 Bamboo Bookkeeping now provides a number of bookkeeping and other non-tax services to AFS clients. On the tax preparation side, she really has mastered taxes for individuals and small businesses. She loves just meeting people and hearing about what they do for a living and for fun. She also has become our tax expert for daycares, property managers and service businesses like salons, tattoo shops and cafes. Her next designation she is working on is Enrolled Agent. This will allow her to represent our clients in front of the IRS. If you’re an individual, a family or a small business, we can help you with all your tax needs. Contact us today to see how we can help.